Many women shudder when they recall the furniture their husbands brought to the marriage. Not Leslie Brooks. Her husband Michael’s late father, Terry, hailed from Charleston and spent his retirement days acquiring antiques and artwork in the Holy City. Michael was the recipient of his refined collection—a wedding jackpot for Leslie if there ever was one. The problem? A move to a Crestline rancher, which the couple has called home for the last 11 years, meant a lack of space to show off the prized pieces. Worse yet, the house was feeling increasingly cramped as their four sons approached teen years. Yes, it was once a rancher! 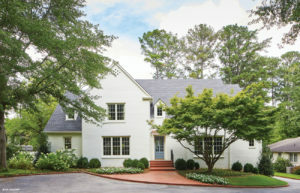 Gabled dormers and a creamy white paint job top off the reconfigured home with classic touches that make it feel like it has always looked this way. 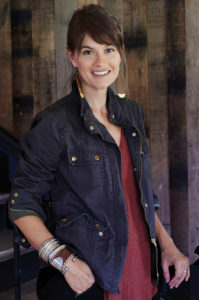 Enter architect Dean Robinson and interior designer Fran Keenan to help the couple reimagine the low-slung ranch home. The result is a two-story abode with an expanded kitchen and master suite downstairs and four boy-approved bedrooms, anchored by a duo of Jack-and-Jill baths upstairs. The overhaul, which took the house from 2,000 square feet to a little over 5,000, also presented the family with the opportunity to raise the downstairs ceiling height from 8 to 10 feet. “It gave the house less of a bowling alley effect and also made way for taller furnishings and more artwork,” Leslie says. The newly expanded house meant all those precious family heirlooms could at long last come out of storage. “As a designer, I always find it inspiring to work with what a client already has—pieces with pedigree that bring instant memories and stories to a space,” says Fran, who, as Leslie’s first cousin, was especially equipped to spotlight the items. Since many of the pieces were rather formal, the designer helped make them feel more family friendly by bringing in a healthy dose of pattern and color. Intricate designs on rugs, wallpaper, and textiles worked to take the edge off of the stately items. In a house full of antiques, an overly modern kitchen wouldn’t do. 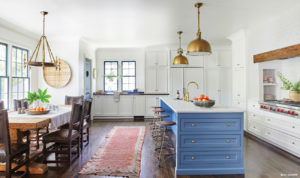 To give the new kitchen a bit of old-house charm, architect Dean Roberts designed an inset range, flanked by shelving alcoves, that feels reminiscent of an old-fashioned kitchen hearth. The breakfast nook features a trio of antique gems—the oak dining table, perfectly-weathered leather chairs, and a brass chandelier scooped up at Tricia’s Treasures. 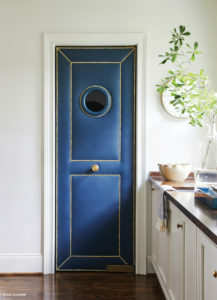 Left: The head-turning upholstered pantry door, complete with nailhead trim, belies its durability. It’s crafted from a virtually indestructible marine-grade vinyl. 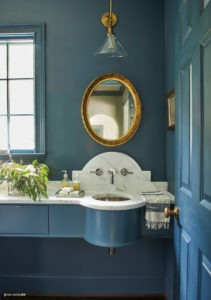 Middle: The handsome powder room takes the home’s blue streak to the hilt by coating every last surface, save the curvy marble countertop. 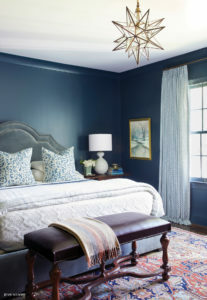 Right: The master bedroom’s daring wall color is softened with plush textiles, including the velvet-upholstered bed frame, knubby white bedding, and perfectly puddled curtains. 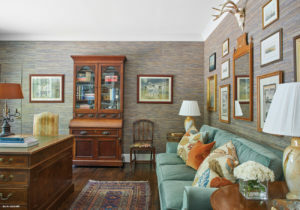 From the multi-colored grass cloth wallpaper to the arrangement of the salon-style wall, the study was designed to mimic the look and feel of a home office that once belonged to Michael’s father. Each project should inspire and reflect the passions and personality of the client. My work begins and ends with lots of listening. It’s all about the mix! My favorite hashtag is #oldbreaksthemold. 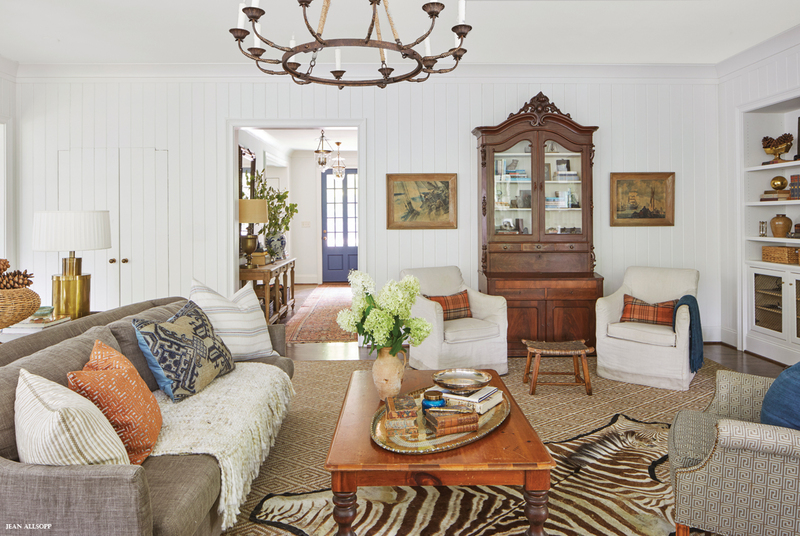 The market can be saturated with the same look, but antiques bring the needed integrity for timeless appeal. There’s strength in numbers. It’s as true in decorating as it is in anything else. Gather like items and display them in one place. The abundance instantly elevates any item. I try to make any and all family pieces work. That’s especially true when there is an original patina, finish, or texture that only comes with age. A room isn’t complete without ambient lighting and books to infuse a space with soul.